A couple of months ago my daughter was given a Haldane Hebridean wheel by a member of the spinning group we attend. It had belonged to her friend who had moved into smaller accommodation and she no longer had room for it. People had tried to put it together but it was not being very co-operative about treadling, so it became a project for me! I had a search for some information and it seems that the company named Haldane still exists, but they make staircases these days rather than wheels! There are quite a few owners out there, and a Haldane Fanciers group on Ravelry. 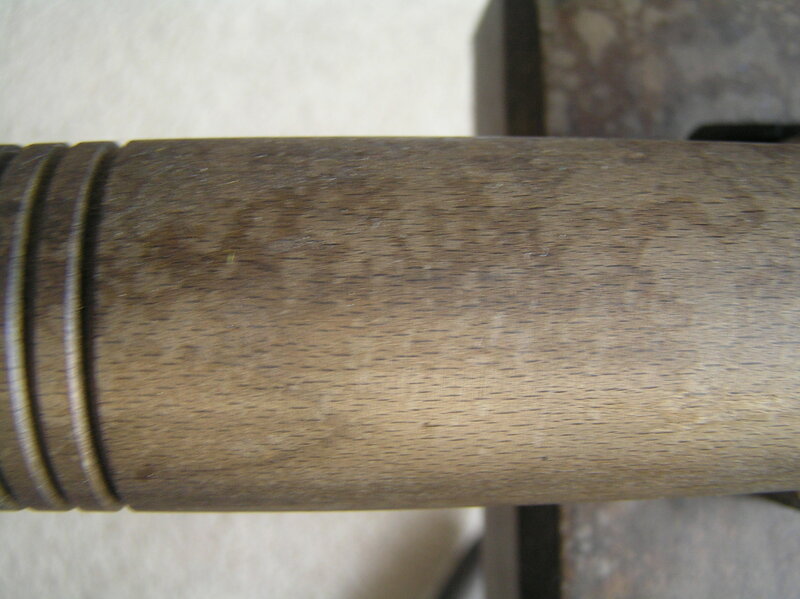 After some advice, oiling, adjusting and generally wiggling things about, I managed to get the wheel to treadle and rotate fairly smoothly – most of the problem seemed to be around getting bits to line up correctly. Originally the treadle bar kept popping out from between the legs and the drive band kept jumping off. Lining up the legs and then adjusting the whorl so it was lined up with the wheel seemed to resolve most of the problems. 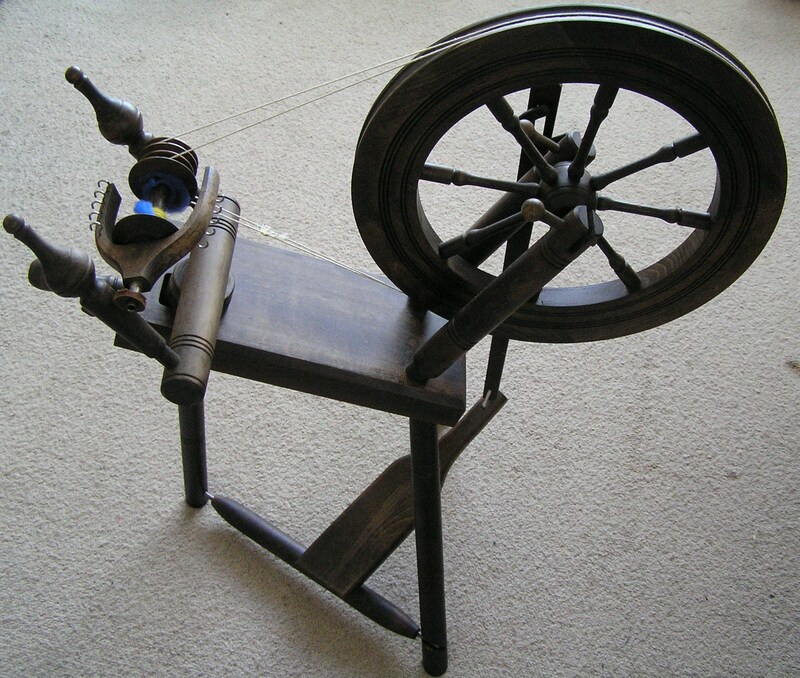 It still has a desire to spin counterclockwise if you don’t treadle just right, but I’m working on that. 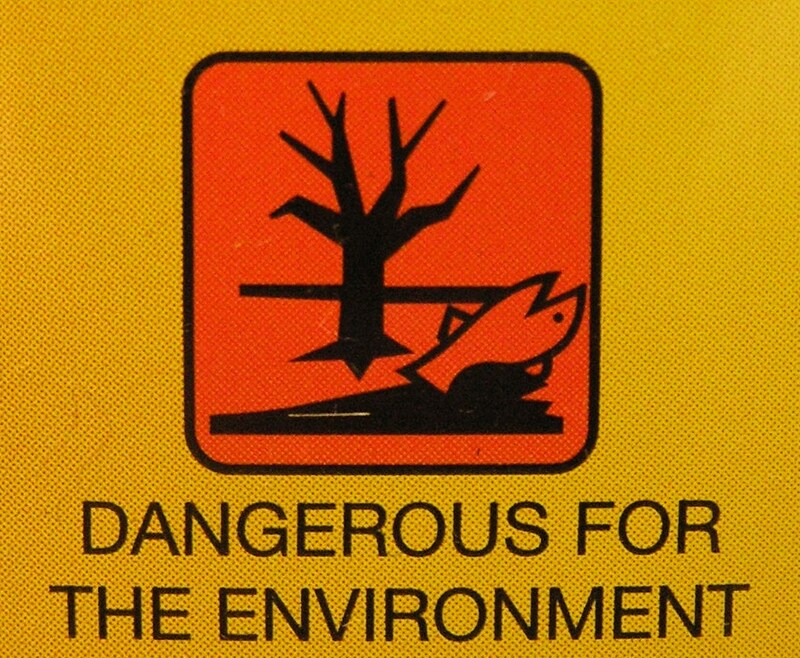 It’s obviously serious stuff, Liquid Gold, if it is misused – I thought this warning image was a very dramatic way of expressing the harm it could do! I did remember to open the windows and use gloves after seeing this though. Two of the legs and the wheel supports did not want to come away from the table, so I decided I wasn’t going to force them! 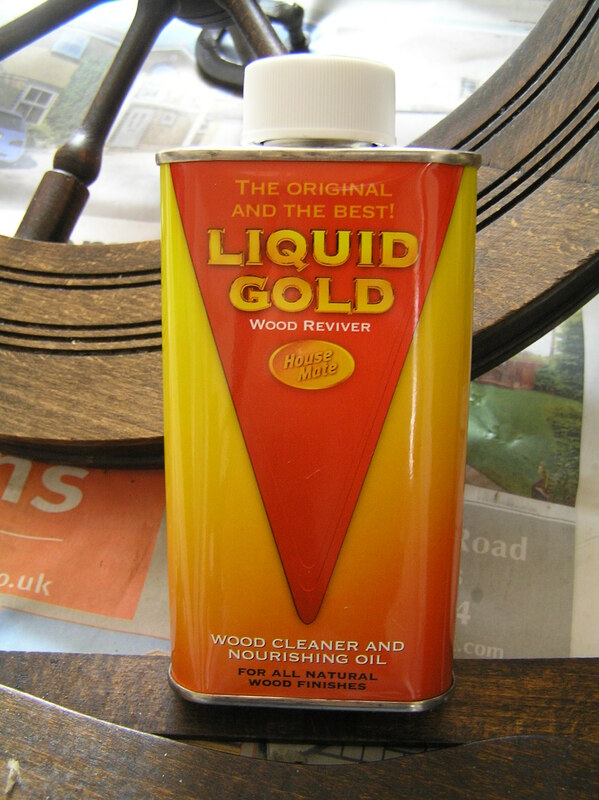 The Liquid Gold itself is clear, but it managed to rub off some of the many years of accumulated grime – the cloth I used became very grubby very quickly. I was probably a bit too generous with the amount I applied, so having wiped the excess off I left the wheel overnight to soak up what it could. In the morning I gave it another wipe over and then put it all back together and treated it to a new drive band and some more wheel oil on all the moving parts. Next plan is to try and acquire a larger whorl – at the moment everything my daughter produces is very overspun and I cannot get her to treadle at anything other than breakneck speed! Hopefully a big whorl might force things to slow down a bit and encourage her to continue spinning! What a beautiful wheel! I love the way the Haldanes have a graceful, fairy tale look without being too fussy. One of my when-I-have-a-bigger-home wheels…good luck with it! Geez gosh, Most of the people who own Haldanes seem to be in the UK. I bought my wheel on Ebay 2 years ago. I knew nothing about spinning wheels, I know slightly more than nothing currently. The wheel came disassembled in a box. That was a jigsaw puzzle for a virgin spinner. I have not had much success in procuring parts or extra bobbins. Thanks to this sight I was able to get a supplier. In my little Ebay experience I ended up with 2 wheels accidently not so haha but its all good. So I am the owner of an Ashford traveler and the Haldane. I love my Haldane. I have gotten it tuned and smooth. The downer is that it does not travel easily. So if I want to spin by the lake it is inconvenient. Am I weird? how many of you take your wheel outside to spin? The Haldanes seem to have a habit of having legs that fall off if you try to move them 🙂 I do sit outside on the patio with my Ladybug, but only on the (rare) days that it is warm and sunny – spinning by the lakeside sounds heavenly! Hi Sam – I don’t think there is anyone who makes Haldane bobbins as an off-the-shelf item any more, as the wheels stopped being produced quite a few years ago. I think someone has already suggested Frank Herring to you on Ravelry, I’d also suggest http://www.woodland-turnery.co.uk – if you look at this thread http://www.ravelry.com/discuss/haldane-fanciers/1549979/1-25#18 you’ll find Joan’s work on an old Hebridean wheel she restored. 07 December 2011. Haldane Bobbins ARE available. I just received 3 perfect ones turned by Woodland Turnery @ My three newly made small bobbins for my Haldane “Lewis” arrived today. For a cost of 18 pounds sterling each plus shipping. Please contact Joan at the following email address. Mary Caroyn Mitton, “Lewis” Haldane wheel. I noticed your reference to Haldanes now making staircases, I believe you are looking on the wrong site. The site I always used was http://www.haldanes.co.uk/ this does not seem to be active although it is copyright 2013 however there are some active links to other spinning and weaving sites which may be of interest. I was looking at some of the yarn you have produced and it is quite impressive. I am still playing with cleaning fleece and thank goodness someone gave me seceral fleeces. At least when I screwed it all up I wasn’t out much. Makes great felted slipper and handbags, plus its practice. There was tons of vege matter and dirt plus a lot of second cuts. Second cuts makes for some fun yarn. Where I am from we don’t call it crap we call it rustic, HaHa. My yarn on my ashford is not very consistent so I guess it mean very little that the wheel doesn’t take up much space.. My yarn from the Haldane is far better and looks pretty good. With regard to spinning by the lake I have a little boy who loves to fish. So while I watch him I take the portable wheel and some fiber. The other kids run and play.. It is beautiful to look out from the dock at the boats and birds on the lake. I guess with all that I maybe shouldn’t care so much how my yarn comes out. I am going to get a good fleece this year and get serious. 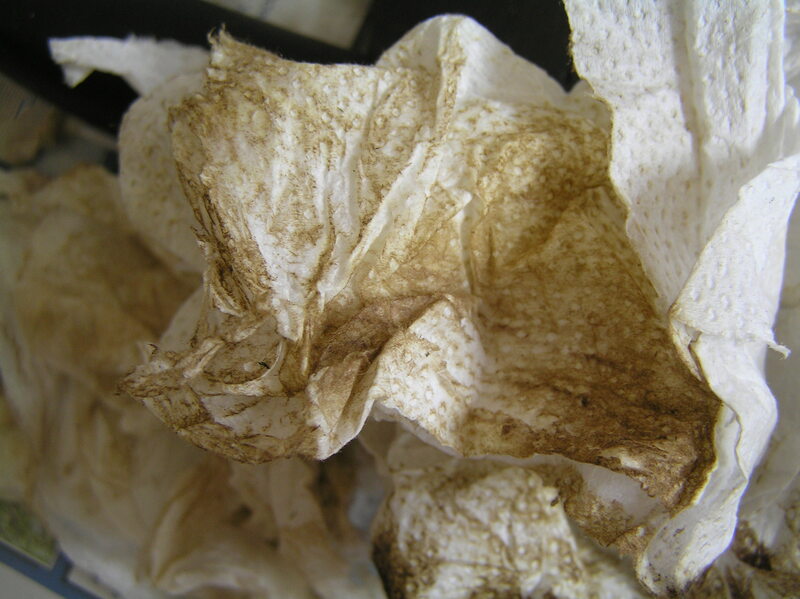 Do get a good fleece – struggling along with a matted/grotty fleece isn’t fun and you aren’t getting the chance to do your best spinning if you’re fighting VM and second cuts. There are plenty of sheep out there willing to make your life more enjoyable! I am going to the spinners and weaver guild annual textile show tomorrow. I am hoping to get invited to a couple of sheerings. Then I can choose the fleece right there. I am always in awe at the yarn. baskets, and fabrics produced by these artists. I picked up a couple books on types of material and spinning. Hoping the tips will be handy and improve my work. While I wait for good fleece I am taking a bash at knitting socks. I am stinking frustrated with turning the heel but I am sure it will all work out in the end. I have just bought a second hand Haldane wheel, can you tell me where you got your new driveband? Did you succeed in getting a larger whorl? I have been looking without much success. Thanks. I haven’t bought a larger whorl, I’m not sure that they existed as an off-the-shelf item, I would contact http://www.woodland-turnery.co.uk/ if you are interested in getting one made. I use a cord used for stitching leather. 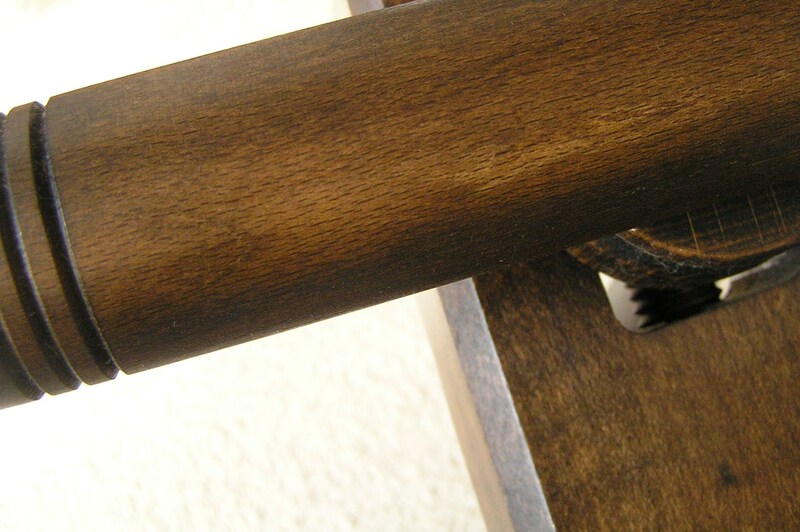 It is a non natural fiber, but it is a beige tone and you can melt the ends that way the wheel turns smooth. My teacher spins hemp or linen I am not quite that dedicated. The wheels all look pretty similar! One bobbin will let you spin a single length of yarn, which can be used to knit/crochet with, but often yarn is made of several singles plyed together, so you need enough bobbins to spin the singles and then another to ply them. (Or you might just start lots of different projects and end up with lots of bobbins filled with lots of differs things…)! Thanks for explaining bobbins. I *so* understand being in the midst of a number of projects. Any idea of the value of a Hebridean these days? 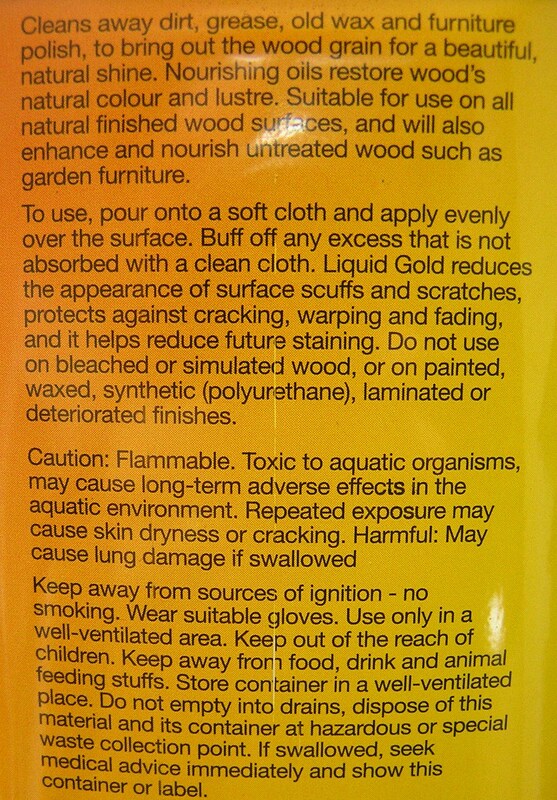 My piano needs a good treatment with Liquid Gold, but I wouldn’t have adequate ventilation to use it. I wonder what else might work. Funnily enough I saw a Hebridean at a local show this weekend, for sale for £100. Ypu can just wind the yarn into balls, then ply. I have an ashford lazy kate, I wind the yarn onto other bobbins. Right now I am using weaving shuttle bobbins because I am only spinning 1/2 oz of fiber before winding off. Nobody has mentioned it but the position of the mother=of=all may need to be adjusted to increase/decrease tension. Sometimes when learning it helps to ply two commercial yarns together to learn how to adjust tension and spin. Also, as the bobbin fills the tension might need to be adjusted. I have a Toika wheel, it works better for fine yarns. I did have an Ashford Traditional and could spin somehat heavier yarns. Hi, I’m newish to spinning, and found your page by accident while looking for something else! I am currently learning to spin on the last wheel ever made by Haldanes, which is owned by the lady who made it. She is a friend of mine and was keen to pass on her knowledge, and so kindly lent me her wheel. I’m having so much fun learning, and I feel privileged to have the use of this lovely, special wheel. I’ve had mine for probably over 30 years. Love it. ☺ I also have the Ashford Joy & their Traveller. 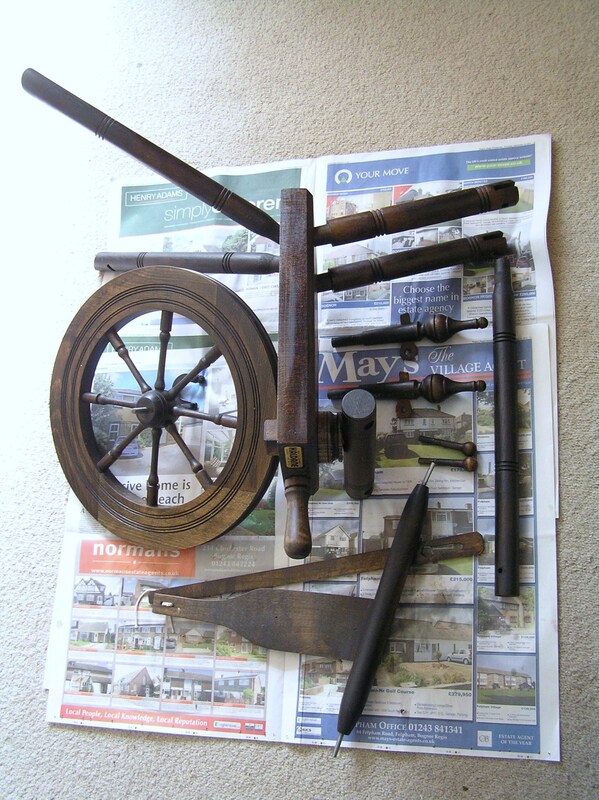 I’m glad to find this post, I acquired a preloved Haldane Lewis wheel very similar to what you have there and with similar issues. Your post gives me hope of smoothing it out so I don’t have to stop all the time to fix squeaks/ the drive band etc 😉 I will definitely look for that Ravelry group too. Thanks for sharing!